Many people would like to save more money, contribute more to retirement, and build a bigger emergency fund, but they may be working with limited funds or little discipline, among other savings challenges. You might find that you're putting off saving money yourself if you’re grappling with a bunch of credit card debt or other obligations that you feel need to be taken care of first. The problem is that if you wait on saving money until every penny of debt is gone, you have lost valuable months and years of investing time and compound interest. 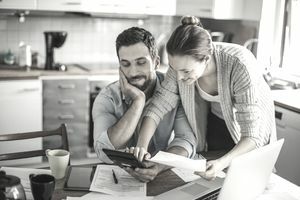 The following pointers can help you find ways to squeeze in a few easy savings tricks that will start accumulating money in an almost painless fashion. Approximately one in three Americans, about 34 percent, hold revolving credit card debt, according to the Simple Dollar. Revolving credit card debt isn't referring to using your favorite piece of plastic to ring up a purchase and promptly going home to pay the bill in full. Many people carry a balance month after month and are continually paying interest on that balance. According to a study by MagnifyMoney, 76 percent of the people who do hold credit card debt are paying interest rates of 15 percent or higher. If you are among these people holding a balance and paying high interest, just remember that you’re not the only one. Don’t just make the minimum payments and hope that your debt will magically disappear. Create some type of a plan that allows you to repay your debts. You can either tackle the credit card that has the smallest balance first, or you can repay the balance on the card with the highest interest rate. Put yourself on a cash-only diet so that you don’t rack up any additional debt. Cut back on any unnecessary items such as clothing, shoes, furniture, restaurant meals, alcohol, cigarettes, cookies, soda, potato chips, cable television—anything that isn’t strictly necessary. Now that you’ve slashed your discretionary items, think a little more deeply about whether your remaining expenses, the so-called necessary expenses, are truly needed. Do you have to spend that much money on gasoline, or could you walk, ride your bicycle, or take the bus more often? Do you need to continue living in your nice home, or could you downsize to a smaller apartment and rent out your current dwelling? If you want to try overcoming your debt by increasing your income, sell some of your older items on eBay or Craigslist. Find a freelance or consulting gig to generate side income. If you're a parent, pick up a few babysitting jobs, ideally ones in which you can bring your children over to the house while you watch someone else’s kids. You’ll be making money for hours spent doing what you'd be doing anyway. Review your credit report to make sure there are no signs of fraud or unauthorized charges. If you see any, contact your credit card issuer to cancel your card and dispute the charges. Sign up for free credit monitoring at a website such as Credit Karma or Credit Sesame. You already know that you’ll need to spend once a year on birthdays, holidays, vacations, higher heating or cooling bills that take place seasonally, and so forth. Begin saving money throughout the year so that you will be ready when these expenses unfold. How can you know how much to save? Figure out what you spend on every given annual event and divide by 12. For example, if you spend roughly $800 every holiday season on airplane tickets to visit your family as well as a few gifts, divide that $800 by 12. It comes to a total of $66 per month: the amount you'll need to save to be ready for that annual expense. Saving all year long helps keep you from getting caught by surprise when you have to pay those one-time bills. One of the best ways to get yourself back on the right path is by carefully monitoring every dime that comes in and goes out. Once you have more breathing room within your budget and you are debt free, you may not need to be so scrupulous. For the moment, though, you should carefully monitor all of your income and spending so that you know where your money is going. You can curb your impulses on your bigger financial leaks, too.